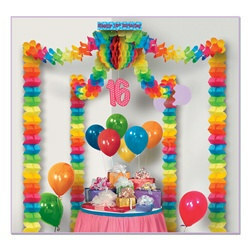 Decorate a large area at a 16th birthday party with this colorful 16th Birthday Party Canopy. The 16th Birthday Party Canopy comes completely assembled, simply attach the blue Happy 16th Birthday box to the ceiling and let the decoration fall or stretch to approximately 20 feet. Under the box there is a multi-colored ball that is folded flat simply open using paper clips or glue (not included). The 16th Birthday Party Canopy will go with any theme with its rainbow of colors, sorry balloons are not included in this set as pictured.